In Sterling Heights, Mich., a young couple found an abandoned white cat in their backyard. After a day of failed efforts to catch the feline, he finally became ensnared in a live trap and was rushed to a veterinarian. The condition of the cat was horrifying. Someone poured some kind of acid chemical on the cat’s neck, which melted the fur and burned the flesh down to the muscle. The cat cannot completely close his eyes because scarring has pulled the skin on his head tight. The cat also walked with a limp, and doctors guess the animal’s paws were at some point tightly tied together. Since the incident was reported, the cat, named Snow, has become something of an Internet sensation. After Snow’s Facebook page was created, well wishes and donations have poured in from around the world. Snow has a long road to recovery ahead of him. 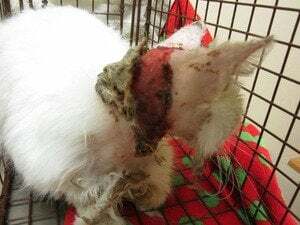 Silvadene cream, which is used on human burn victims, must constantly be applied to the afflicted area, and the cat is also taking steroids and antibiotics in an ongoing battle against infection. Snow is also FIV positive and suffers from a weakened immune system, making recovery more difficult. Doctors believe the feline will probably require skin grafts. Those interested in contributing to Snow can do so at his Facebook page and Amazon wish list. A reward has been offered for information leading to a conviction of the person(s) who attacked the cat.